DSD: it’s a contentious subject among those interested in all things high-resolution. I’ve been subject to some quite scathing comments from some keyboard warriors for suggesting anyone should buy products not supporting DSD, which they see as the way, truth and light; others, meanwhile, see the format originally adopted for Super Audio CD as a red herring, sure to spread confusion if the mass-market is ever to be tempted beyond MP3 and into downloading and playing music at CD quality and beyond. I can see both sides of the argument: while on one hand I’m in agreement that a whole raft of new formats, some of which can only be played via certain pieces of equipment, is likely to confuse the market – after all, why do you think SACD was mainly developed as a hybrid format, with a secondary layer able to be played on standard CD hardware? –, I’m also all for being able to play music in a form as close as possible to the way it was originally recorded and mixed. And if that means 24-bit/192kHz, 24-bit/384kHz or 2.8MHz/5.6MHz DSD, then so be it – provided, at least, it can be done without strewing the desktop or equipment rack with a mass of boxes, endless plugging and unplugging, and of course having to spend the money for all those boxes. For that reason, the latest move by Pro-Ject seems entirely sensible to me: the company has recently launched a free DSD update for its DAC Box DS digital to analogue converter: existing owners of the unit can update it via a download using a Windows PC, while all the units now on sale will come complete with the new software ready-installed, at £299. I’ve long been a fan of the Pro-Ject/Box Design concept, ever since it moved on from the first arrival – an offboard phono stage for the company’s turntables, which has gone on to sell in the hundreds of thousands – to a complete range of compact hi-fi components, now separated into a number of sub-ranges. There are digital components from CD players barely bigger than a disc to DACs, iPod docks and even USB/card players through to a range of streamers, while the analogue range extends to integrated amps, preamps, power amps and tuners, plus a tiny receiver just over 10cm wide and 3.6cm tall, but complete with FM tuner and a 2x25W amp built-in. Of course there are still the phono stages: there are simple models, tube-powered models and versions with USB outputs for recording to a computer, plus the flagship Phono Box RS, a dual-mono design complete with switchable loading and equalisation. The Box design models are always a feature of the company’s show stands, complete with smart multicoloured wooden sleeves (above), designed to fit four of the little boxes into less than the space occupied by a standard hi-fi component. But back to the DAC Box DS, which sits in the company’s midrange line-up, above the entry-level DAC Box s and the hideaway DAC Box TV (the latter designed to connect TV sound to a hi-fi amplifier, and in the company’s no-frills black ‘Elemental’ casework) but below the high-end DAC Box RS, which offers a tube output stage, balanced and RCA outputs and an I2S interface for use with the company’s CD Box RS. 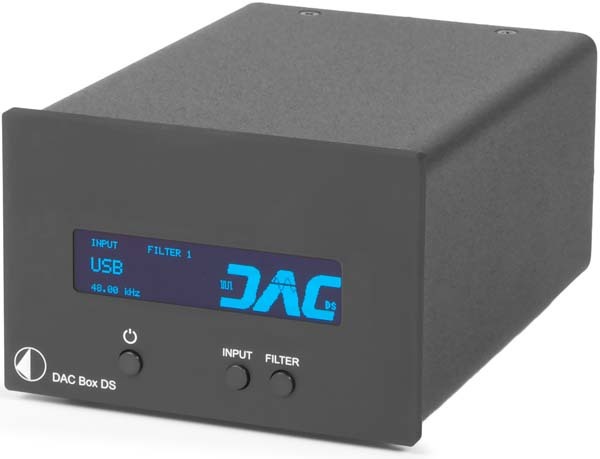 The DAC Box DS is in the ‘narrow but tall’ casework of the other DS components, at just over 10cm wide and twice as tall as the smallest S-Line products, at 7.2cm. There’s a prominent blue on black display, selectors for input (coaxial/electrical, Toslink optical and asynchronous USB-B) and filter (‘steep’/’optimal phase’) and an external power supply and – well, that’s about it. Under the lid it uses TI’s PCM-1792 converter with 8x oversampling, and can handle PCM at up to 192kHz, and – with the update – both 64x DSD and 128x DSD sample rates. 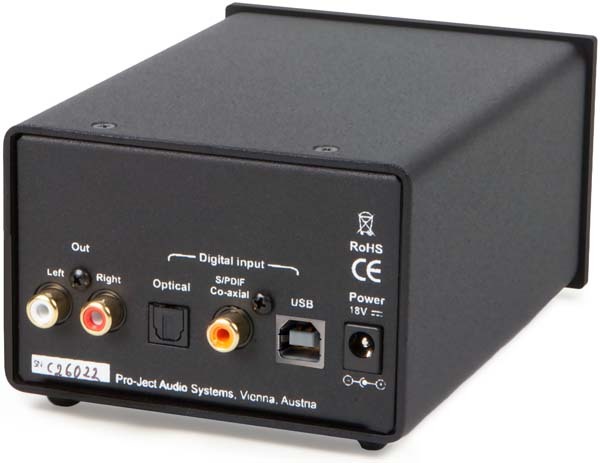 Operation couldn’t be much simpler – a 24-bit/192KHz driver for Windows PCs is provided on a disc in the box, but with Macs, and for lesser formats on Windows, the Pro-Ject just works as soon as it’s connected to a computer via the USB socket. Using the Audirvana player on my Mac Mini desktop, I was able to play everything from Internet radio and MP3 files all the way up to full-whack 5.8MHz DSDs through the Pro-Ject, running its output straight into the Focal Pro CMS 50 desktop monitors via a simple preamp – in this case the Trends Audio PA-10 – and also connecting the DAC via a longer USB cable to my main Naim Supernait 2/PMC system. And in each case the little DAC Box gave a good account of itself: perhaps it’s a little warm and safe at times when compared with much more expensive DSD-capable DACs, and indeed some non-DSD models designed to handle high-resolution music, but this balance is infinitely preferable than the brittle, slightly ‘trying too hard’ balance exhibited by some DACs at or below this price-level. The warmth on offer here is never intrusive, and the presence and ambience that’s so much a part of a good DSD recording is largely n evidence, but the bass is just a shade lush and bloomy, whereas others deliver a tighter punch. Similarly, while it’s appreciated that the DAC Box DS is lacking in any brittleness or treble sting, there is a slight sense of the top end being slightly rounded off, which is probably no bad thing when using the DAC with budget amplification and speakers, but leaves the feeling that the music has a bite more to give with better partnering electronics. What’s not in doubt is that the Pro-Ject gives an entirely enjoyable listen across a wide range of sources, file formats and genres, from radio drama – it was very impressive with the recent Radio 3 Antony and Cleopatra – through to hi-res music. 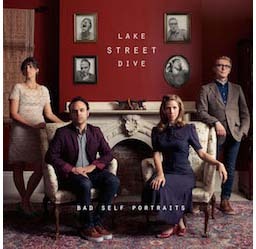 Playing the new San Francisco Symphony Mahler Kindertotenlieder in DSD it has a winning combination of drama, orchestral weight and close focus on the singer’s intonation and expression, while it conveys the infectious rhythms of Lake Street Dive’s fab Bad Self Portraits set, a FLAC download from the band’s website, with fine impetus. Trying the two filters reveals that Filter 1, the ‘steep’ one gives a bit more drive and an impression of more bass, while the ‘optimum phase’ Filter 2 setting is generally a little more open and spacious, making more of the three-dimensional stereo effect on high-quality recordings. There’s a lot of personal preference and ‘your mileage may vary’ in all this, and I’m not going to make any recommendation that one setting or the other should be adopted as a default; in my listening I often found myself switching back and forth between different recordings and even different tracks on the same album. 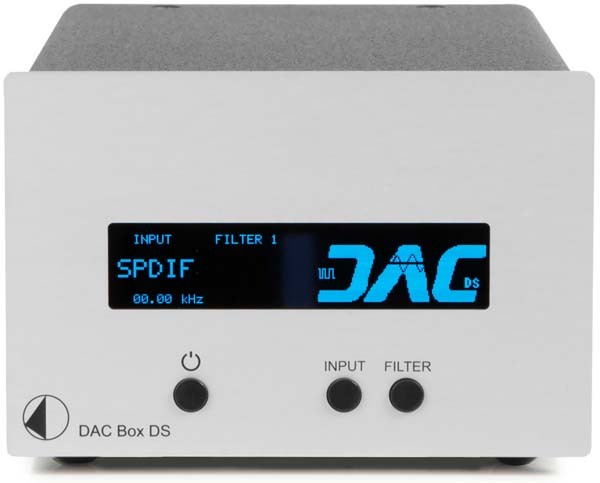 Nicely screwed together and with a big, involving sound free from sonic nasties and with much to enjoy, the Pro-Ject DAC Box DS is a fundamentally very good product made even better with the free addition of new capabilities. Whether you’re a DSD fundamentalist or just like your music played well and your options kept open, this is a pretty solid buy. I’m a sucker for small box hi-fi. I wonder how these compare with Lehmann Audio? Although larger than these boxes, I bought my Sugden Bijou system as they were compact, high quality audio products – and it still sounds great. How does the Pro-ject DAC Box DS, in you opinion, fare compared to the Denon DAC 300 USB? I’d say each is well worth auditioning.